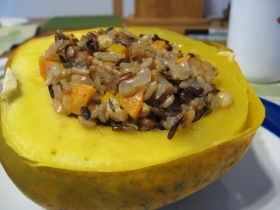 Have you made Baked Autumn Vegetables With Barley And Wild Rice? 1. 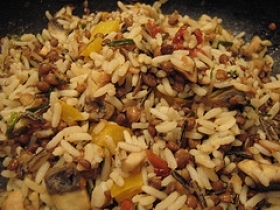 Place wild rice in strainer and rinse under cold running water. 2. Place rice in saucepan; add 4 cups water, cover and bring to boil. 3. 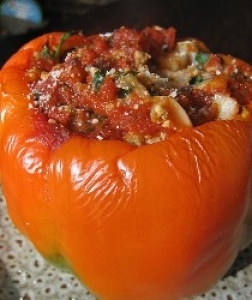 Reduce heat and boil gently for 1O minutes, drain and set aside. 4. In large skillet, melt butter over medium heat. 5. Add onions, cook until softened. 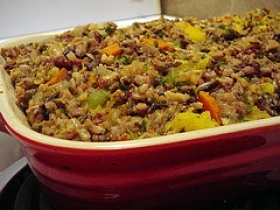 Stir in barley and wild rice. 6. 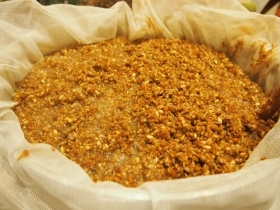 Transfer mixture to 16-cup baking dish or roasting pan. 7. 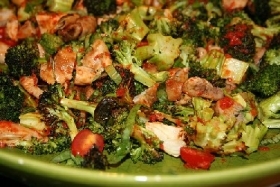 Spread vegetables and mushrooms (if using) over grains. 8. Sprinkle with salt and pepper. Pour in chicken stock and cider. 9. Cover with lid or foil. Bake in 375F (190C) oven for 1 to 1-1/4 hours or until barley and rice are tender (the rice should be slightly chewy). 10. Makes 8 to 12 servings Preparation time: 20 minutes Baking time: I to 1-1/4 hours Per serving for 12): 230 calories, 4g fat, 44 g carbohydrate, 7 g protein; excellent source of vitamin A; good source of niacin, folate; very high source of fibre NOTES : Made 10 24-97 for Tim. 11. Wonderful! Next time I will halve this recipe. 12. 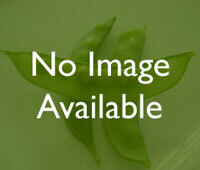 I substituted celery and carrots for the celery root. This recipe contains potential food allergens and will effect people with Wheat, Butter, Gluten, Mushroom, MSG, Potato, Poultry, Rice, Malt, Fructose Malabsorption, Celery, Onion, Apple allergies.